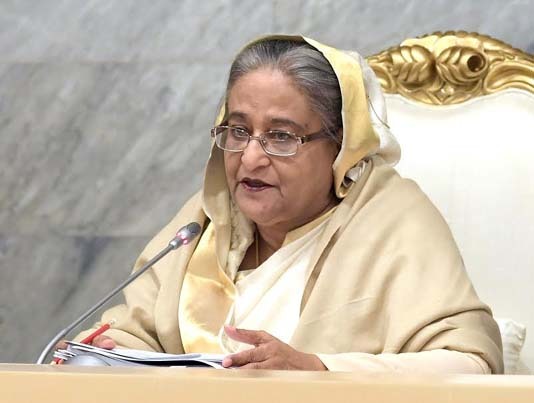 Prime Minister Sheikh Hasina today directed all concerned including ministers to uphold the dignity of the people’s confidence and trust that they reposed in the Awami League through the December 30 elections. uphold the dignity of their trust by improving their living standard,” she said in her introductory speech at the maiden meeting of the ECNEC at the Planning Commission at Sher-e-Bangla Nagar here this morning. “We want the lot of the people living up to the grassroots level to be changed and we’ll have to work giving attention to that end,” she added. Awami League government on January 7 following the AL-led Grand Alliance’s landslide victory in the 11th parliamentary elections on December 30. The prime minister said her government is taking all plans and programmes with a goal of changing the fate of the grassroots people of the villages. “Bangladesh will be established as a poverty-free country at the fastest possible time through it,” she said. In this connection, Sheikh Hasina put emphasis on increasing surveillance on the ongoing development projects to speed up their pace and quality. “We’ve passed many projects speedily at the end of our previous tenure. We want to start and complete the works of those schemes fast,” she said. The premier said surveillance on the work of the projects will have to be raised to accelerate the pace and improve their quality. “As much as the vigilance on the work will raise, the pace and quality of the work will enhance to that extent”,she said.